Posted November 26th, 2017 by Mike Boyes & filed under Human Development, Language Development, Language-Thought, Learning, Sensation-Perception. Description: Before you read any further go and listen to these two YouTube linked videos ( https://www.youtube.com/watch?v=TaC6D1cW1Hs and https://www.youtube.com/watch?v=ZVuUMCLF48k). 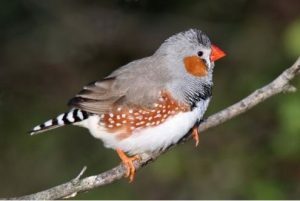 They feature birdsong, an specifically Zebra Finch birdsong. Now you have not likely thought of this but birds have to sing the right songs the right way if they are to get by in their worlds. The male Zebra Finch in the first clip above has to know the right mating song and know how to perform it well if he is to successfully reproduce. How do they do this? Well, they are NOT simply born with their songs wired in. They pick them up and the songs vary in some ways not just by species as you might expect but across geographic regions in ways suggestive of cultural (learned) variation. So, there IS SOME learning involved in birds learning bird song and humans learning spoken language. But, what sort of learning IS involved? Think about what might be the answer to this question and then read the article linked below to see what recent research with Zebra Finches at McGill University is suggesting. Source: Do birdsong and human speech share biological roots? Science News, ScienceDaily. So, birdsong and language learning is NOT simple learning. BF Skinner suggested that human infants and toddlers learn the language spoken by their parents and older siblings be being rewarded for successively better approximations to local speech utterances (think shaping). Parent’s Do occasionally correct their young children’s utterances, don’t they? Well, no actually, parents typically correct children’s utterances for meaningfulness rather than for exact correctness. Noam Chomsky pointed out that if you look at how (in)consistently parents correct their children’s utterances from a linguistic point of view AND take into account how many rewards are needed to establish a pattern of consistent behaviour it turns out it would take a human child about 3000 years to “learn” the speech that a typical 5-year-old has picked up in their 5 years of life. Chomsky’s idea that infants arrive with a universal grammar wired in that facilitates their acquisition of whatever language is being spoken around them has been much debated and may be a bit too wired in. The research discussed in the article linked above, however, is suggesting that something IS there in both birds and humans in the way of language learning preparedness. Perhaps there are certain patterns we are “biased” towards seeing (as seemed to be the case with the Zebra Finches). Figuring out what those biases are attuned to may be the key to understanding language (and bird song) learning. Do toddlers “learn” spoken language the same way they might memorize a nursery rhyme? What part of speech or of birdsong may be universal? What might a “bias” for picking up on certain speech characteristic involve? And why might having one or more such bias(es) be important?